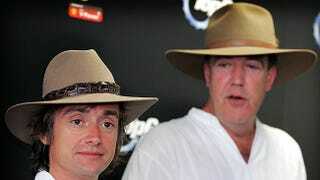 Top Gear spotted in Australia's Northern Territory. Jeremy Clarkson and the BBC's Top Gear team are in the Northern Territory, driving a trio of luxury performance cars. They were spotted Tuesday in Berry Springs, in Darwin's rural area, seen driving a bright yellow Bentley Continental, a Nissan GTR and a BMW M6. They were later seen further south, drag racing at an airstrip near the Territory town of Batchelor. What exactly they are doing in the Northern Territory remains a mystery, with rumours ranging from racing a convoy of road trains on the open speed limit section of highway near Alice Springs, to recreating the Australian road trip depicted in the British movie The Inbetweeners. A spokesperson for BBC Worldwide said: "I will not be giving out any details of Top Gear's forthcoming trip." They're now dead. Spiders, crocs, dropbears and all that.